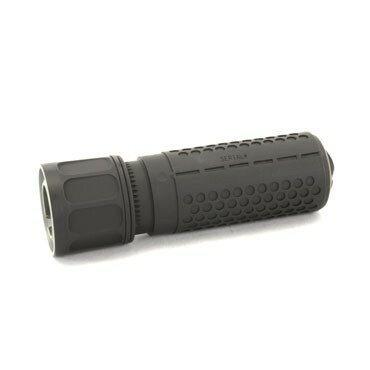 The shorter Close Quarters Battle (CQB) line of Quick Disconect Coupling (QDC) Suppressors are designed for better maneuverability in confined spaces. The entire QDC line of suppressors are compatible with the KAC QDC muzzle devices, which come standard on all KAC rifles and are also available separately. These suppressors are currently in service with various SOF and LE agencies accross the country, and feature an innovative mounting method, providing the user with consistent and minimized POI shift, and effective flash and sound suppression. The attachment method separates the locking parts from mounting surfaces, making carbon build-up a reduced concern. Consistent POI shift is maintained through repetitive lock-up of the mounting hardware during attachment.